Get best life insurance plans with high sums at low premiums. Compare now! This company offers various types of insurance products at a wide scale. Right from traditional products to different investment plans Bharti AXA Life Insurance Company assures you higher coverage at a lower cost. Use of basic infrastructure, customer base and knowledge from Bharti Enterprises makes Bharti AXA Life Insurance Company to grow at an efficient and considerable growth. Bharti AXA has received multiple awards. For the 2nd year in a row, it had been the most trusted brand in the country, as well as grabbed the 3rd spot in the customer loyalty, according to customer satisfaction. Tax benefits: Section 80C and 10(10D) of the Income Tax Act, 1961 provides tax benefits for premiums paid regularly. Cost: Bharti AXA Life insurance plans are quite cheap. Premium Waiver rider: Under this rider 100% of all future premiums under the base policy are waived and paid by the company on the death & total permanent disability or critical illness of Proposer, depending on the chosen option. Can make up to 3 unrelated critical illness Claims during the Policy Term. In this policy, the investment risk in investment portfolio is borne by the policyholder. An Investment Plan where you invest money for a limited time-frame and reap good returns at the end of the policy term. You can enjoy benefits for 10 years while paying Single Premium or paying for 5 years only. A limited Premium payment plan with a longer term to remain invested. Pay once or for 5 years while accruing benefits for 10 along with the flexibility of partial withdrawals. Ease of buying: No requirement for medical underwriting. Dedicated claim handler will assist you throughout the claim process. Starting from intimation till the claim decision, your dedicated claim handler will explain the entire process, inform you about the documents required, will assist you while you fill the form and will also resolve your queries. If need be, he will visit you and update you at each milestone. Quick processing to make it convenient for you. Our processing timelines are much faster than IRDA. IRDA takes 15 days for raising requirements, while we aim to complete it in 5 days after receipt of all required documents; IRDAI takes 30 days for non-early claims, while we aim to complete it in 5; IRDA takes 180 days for early claims, while we aim to complete it in 90 days. From receipt of all required documents. Family care benefits to protect your family. A unique proposition by way of which, a part of the life insurance benefit i.e. Rs 100,000 is paid as a lump sum to the nominee in case of death of the life insured, within 48 hours** of submission of all relevant claim documents. Select your online bank account or debit/credit card & confirm the payment. Enter your authentication details & receive an online confirmation. 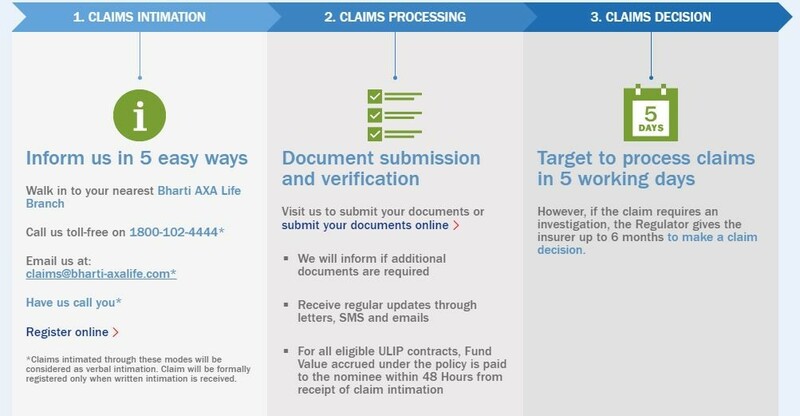 What is the online claim filing process at Bharti AXA Life? What are the possible reasons my Bharti AXA Life claim was rejected? Any information related to the Life Insured which has influence on the underwriter's decision is not disclosed in the proposal form, it is termed as "non-disclosure". Similarly providing incorrect information while answering questions in the proposal form is termed as "mis-statement". When such non-disclosure or mis-statement of material fact is observed, the claim may be rejected. What is the average claim processing time for a Bharti AXA Life insurance policy? Can I register for ECS to pay off my premiums? Electronic Clearing Service (ECS) offers a convenient way to pay your premium directly from your bank account. To avail this facility, you simply have to submit the Auto Pay form along with a cancelled cheque (which helps record the MICR code of your bank) to your closest Bharti AXA Life branch. What are the various ways I can pay my Bharti AXA Life insurance premium?